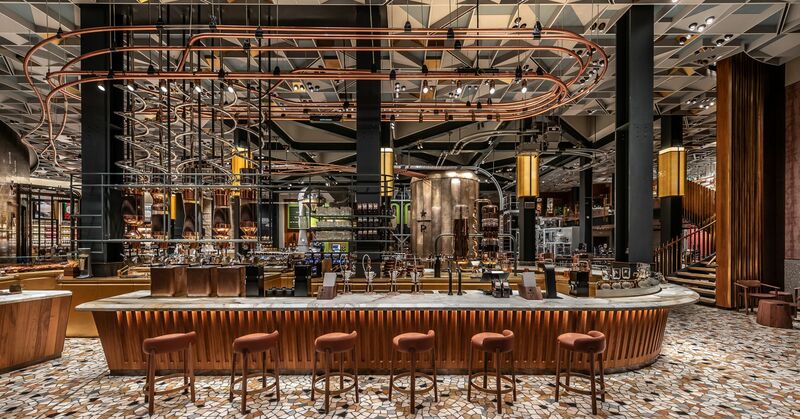 Starbucks recently made its first foray into the Italian market with a Milan-based roastery location in the city's Palazzo della Poste on the Piazza Cordusio. Atypical to the average store, the 25,000 square-foot roastery is designed to provide a more upscale experience, with a menu boasting more than 100 cocktails at its Arriviamo Bar and more than 115 coffee bar beverages. This is one of four roasteries projected to open before 2020, with additional locations including NYC, Tokyo, and Chicago. Aesthetically, the Milan-inspired decor was created to reflect and celebrate the beauty of Italian culture, from fashion, to design, to architecture that pays homage to the city and country. Learn more about Starbucks roasteries here.